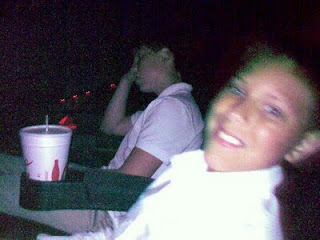 For my son's birthday he wanted to go see the GI Joe movie. We were going to see the 4 o'clock showing, meaning we would arrive after the previews started because they got off the bus at 3:50. So, we were in a rush. Got the tickets but the lady didn't say which theatre (number). In a rush I glanced at the ticket, saw "cinema 14," and we headed there. Got in, got seated, and realized, hey, the movie's already showing... And it's only 8 minutes after 4. Weird. Anyway, appeared to not have missed much, were enjoying the movie, and it abruptly ended around 5:10. Strange... Was supposed to be a 2 hour and 10 minute movie. Looking at the ticket... Oops, it was in "theatre 6"... The "cinema 14" was part of "premiere cinema 14." Boy did I feel bad, having now ruined the movie he wanted to see for his birthday! And foolish. I went to the counter and explained the situation, and they're letting us see the 5:15. In theatre 14! Oops.